Mama Needs Sushi: 15 Weeks! How big is baby this week? 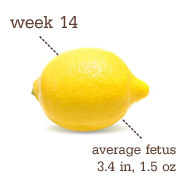 Baby is the size of an orange. Symptoms: Pretty much only dealing with nausea now when driving, but it is definitely worse. Heartburn, and still have some sciatic nerve issues, but it's better this week. Stuffy nose, and swollen gums, which are pretty normal. Aversions: Don't really have aversions anymore, but some things just don't sound appetizing. Sleep: Go to bed early (around 8 or 8:30). Sleeping better at night, and less sleepy during the day. I am loving: That my morning sickness is so much better! Thank you Jesus! I am looking forward to: Gender ultrasound in 8 days! Milestones: Baby can sense light! It's a...: No idea yet. When I hit about 16/18 weeks and I told the dr i hadn't felt anything he said "yes you have, you just didn't know it.." so he suggested I lay flat on my back and just be still and concentrate. Sure enough, I felt really low in my belly a pinch/tug/flutter. After that, you couldn't keep me in any other position when I was home! I just laid there and felt those flutters!! I like your way of presentation. thanks for sharing.